Pompeo was meeting on Sunday with Saudi King Salman, whose country along with Bahrain and the UAE is embroiled in a row with Qatar. Riyadh: US Secretary of State Mike Pompeo is using the Middle East leg of his first trip abroad as America’s top diplomat to call for concerted international action to punish Iran for its missile programs. He’s also urging Saudi Arabia and its neighbours to resolve a long-festering dispute with Qatar that US officials say Iran is exploiting to boost its influence in the region, including in Yemen and Syria. Pompeo was meeting on Sunday with Saudi King Salman, whose country along with Bahrain and the United Arab Emirates is embroiled in a row with Qatar that had hobbled Gulf Arab unity and frustrated the US as it seeks to blunt growing Iranian assertiveness. The ex-CIA chief had arrived in Riyadh a day earlier, shortly after Iranian-backed Houthi rebels in Yemen fired missiles at Saudi Arabia’s southern city of Jizan, killing one person and underscoring what US officials said is a growing threat emanating from Iran. Senior US officials travelling with Pompeo blamed Iran for smuggling the missiles into Yemen. They said the incident highlighted the importance of the Trump administration’s push to counter Iranian supported-aggression in the region. Iran has backed the Houthi rebellion in Yemen and is helping Syrian President Bashar Assad’s government fight rebels there. 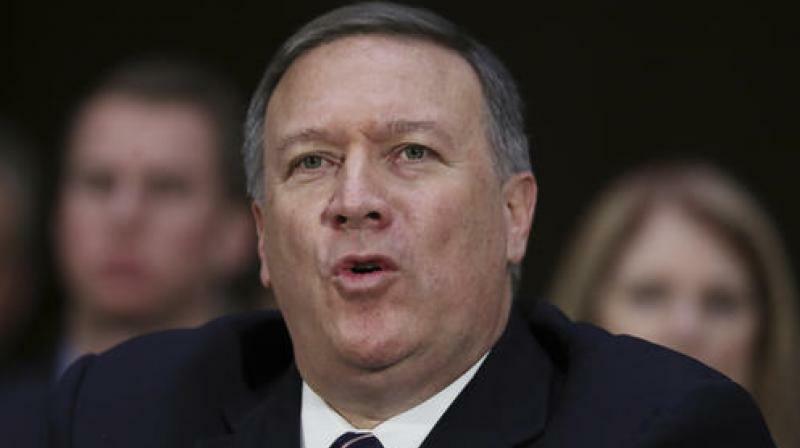 The officials, who were not authorized to preview Pompeo’s discussions with the Saudi leadership and spoke on condition of anonymity, said Iran’s long- and medium-range missile programs had to be countered as part of efforts to strengthen the Iran nuclear deal, from which President Donald Trump has threatened to withdraw by mid-May. The officials said Pompeo would call on other nations to impose tougher sanctions against Iranian people, businesses and government agencies involved in missile development. They said he’d also stress the US commitment to the defense of Saudi Arabia, Israel and other friends and partners in the region. Pompeo will also press the Saudis on contributing more to stabilization efforts in territory in Syria recently liberated from the Islamic State group, the officials said. As part of the anti-Iran push, the officials said Pompeo would make it clear to the Saudis that the dispute with Qatar must end. The crisis erupted last summer, when Saudi Arabia, Bahrain and the UAE blocked the country, accusing it of supporting terrorism. Mediation efforts led by Kuwait and supported by the US, including former Secretary of State Rex Tillerson, who Trump fired last month, have proven unsuccessful. The split gives Iran “room to play” and hampers cooperation on a wide array of other issues, including combating violent extremism from the Islamic State and other groups, the officials said. Pompeo’s meetings in Saudi Arabia, which will be followed by discussions in Israel and Jordan, come just weeks ahead of several key dates that have potential to further roil the volatile region. The embassy move is deeply opposed by the Palestinians, who on May 15 will mark the anniversary of what they term the “nabka,” or catastrophe, when they fled or were driven from their homes during the 1948 Palestine war. Dozens of Palestinians have been killed by Israeli fire during recent violent protests along border between Israel and Gaza. Also looming over the trip is uncertainty over Trump’s policy on Syria, which has shifted between a speedy all-out withdrawal of American forces from the country and leaving a lasting footprint to deter Iran from completing a land bridge from Tehran to Beirut.